Saturday September 12, 2015 - Saudi authorities investigate a crane accident in the holy city of Mecca that has claimed more than a hundred lives as workers do expansion work on the Grand Mosque. Initial reports say high winds could be a factor. Saudi Arabia has begun an investigation into why a crane collapsed in the Muslim holy city of Mecca, killing at least 107 people. 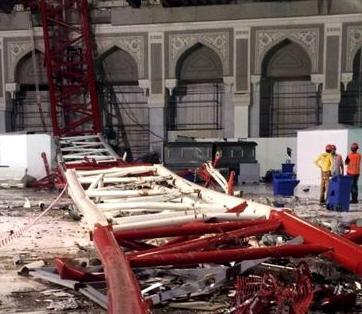 The huge red crane crashed into a part of the Grand Mosque as it was filled with worshippers. Officials say strong winds and heavy rains caused the crane to fall. Correspondents say there have previously been concerns about safety records on Saudi construction sites. The Grand Mosque, known as the Masjid al-Haram, is the largest mosque in the world and surrounds Islam's holiest place, the Kaaba. At least 230 people were injured in the incident. It is unclear how many people were hurt by the collapse or the stampede that followed it. The mosque was packed with worshippers and more than 200 people were injured. The crane was one of a number around the Grand Mosque being used in construction work. The incident happened at 17:23 local time (14:23 GMT) on Friday. Videos posted online showed the moment the structure collapsed, with a loud crash followed by panic and shouting. Bodies and blood could be seen on the floor of the mosque. The head of Saudi Arabia's civil defence agency, Lt Sulayman Bin-Abdullah al-Amr, said an investigation was being carried out to assess the damage, and the "extent of the safety of these sites". 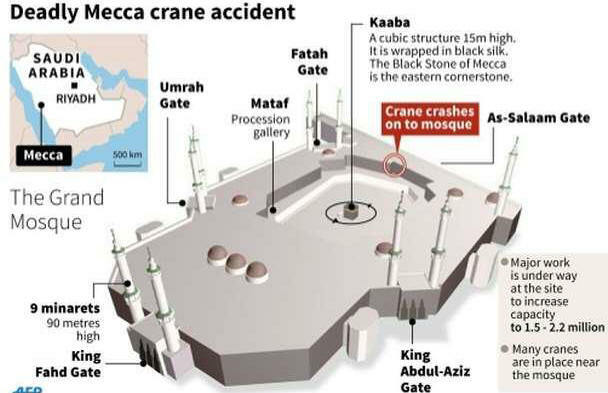 Essam al-Ghalib, a Jeddah-based journalist, said the crane fell through the outer ring of the Grand Mosque and punctured through the roof sending down tonnes of cement and debris onto people either praying or walking through. Mecca is currently preparing for the annual Muslim Hajj pilgrimage. Up to two million people are expected to arrive in the Saudi city from all over the world later this month. 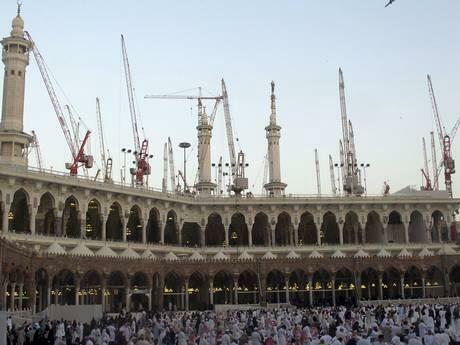 Irfan Al-Alawi, from the Islamic Heritage Research Foundation, told the BBC that the Grand Mosque is currently surrounded by 15 large cranes amid major redevelopment work. "The entire area is like a salvage yard," Mr Al-Alawi said. "Saudi Arabia has to re-think its health and safety strategy," he said, "as there were 800,000 people in the mosque area at the time of the accident." The original parts of the Grand Mosque date back 1,400 years. Consisting of a large square surrounded by covered prayer areas, the building has since been extensively modernised, notably from the mid-20th Century. Saudi authorities began a major expansion of the site last year to increase the area of the mosque by 400,000 square metres (4.3 million square feet), to allow it to accommodate up to 2.2 million people at once. The UK-based Independent newspaper noted - "Photographs of the disaster show a grisly scene, with police and onlookers attending to numerous bodies strewn around the polished mosque floor in pools of blood. Scores of worshippers were in the mosque when the crane collapsed (EPA) Other footage showed bodies and blood amid the rubble, while dazed and bloodied survivors staggering past debris in the immediate aftermath of the tragedy. Saudi Arabia's civil defense authority provided a series of rising casualty numbers on its official Twitter account as ambulances whisked the wounded to area hospitals. Rubble rained down on the gathered masses as they prayed (EPA) The nationalities of those caught up in the disaster were uncertain last night and the Foreign Office was making inquiries to establish if any Britons had been killed or injured. Omer El-Hamdoon, President of the Muslim Association of Britain, said: “Our prayers are directed to those who have died that God shower them with His mercy. "Our thoughts are with the families and friends, at this difficult time, whilst waiting for news. As we pray to God that He gives full and speedy recovery to all those injured. ”The Foreign Secretary Philip Hammond said: "I'm shocked and saddened to hear of the accident in Mecca involving a large number of fatalities amongst those attending the Hajj. My thoughts are with the families of those affected." Ahmed bin Mohammed al-Mansouri, spokesman for the presidency of the Mecca and Medina mosque affairs, said in a statement that the accident happened during a severe storm carrying strong winds and heavy rain. The governor of the Mecca region, Prince Khalid al-Faisal, quickly called for the formation of a committee to investigate the cause of the accident. He directed all appropriate authorities to provide support for the injured. The Grand Mosque - the Masjid al-Haram - contains the Kaaba, the black cube-shaped building which Muslims face when they pray wherever they are in the world and is Islam's most sacred shrine. Muslims are expected to perform pilgrimages to the Kaaba at least once during their lifetimes and once there they walk around it seven times anti-clockwise in a rite known as Tawaf. Several cranes surround the mosque to support an ongoing expansion and other construction work that has transformed the area around the sanctuary. The $60 billion redevelopment is being carried out by the Saudi Binladin Group - owned by Osama Bin Laden’s family. The Daily Mail (UK) has this account - "It has been confirmed today that this year's hajj will still go ahead despite the disaster, and is expected to begin on September 21. The annual pilgrimage is one of the largest religious festivals in the world, and last year drew two million worshipers. One of the five pillars of Islam requires every able-bodied Muslim to perform the Hajj pilgrimage at least once in their lifetime. Muslim faithful from about 160 countries converge on the Islamic city and other locations in western Saudi Arabia to complete the holy journey. The crane fell into the east side of the mosque, with its boom crashing through the roof, killing at least 107 people - with nine Indian citizens, 16 Pakistanis and 15 Iranians reportedly among the dead. 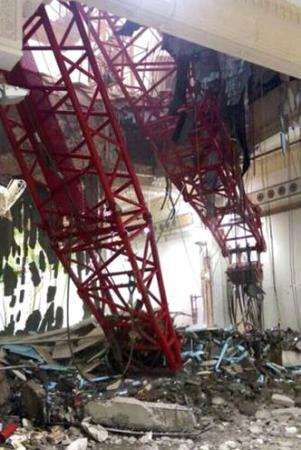 It is not yet known whether all those that died were killed by the crane's collapse, as some reports claim some were killed in a subsequent stampede. The governor of Mecca region, Prince Khaled al-Faisal, was seen talking with police at the mosque a few hours after the tragedy. Irfan al-Alawi, co-founder of the Mecca-based Islamic Heritage Research Foundation, compared the carnage to that caused by a bomb. He suggested authorities were negligent by having a series of cranes overlooking the mosque. 'They do not care about the heritage, and they do not care about health and safety,' he said. Alawi is an outspoken critic of redevelopment at the holy sites, which he says is wiping away tangible links to the Prophet Mohammed. Online activists created a hashtag on Twitter last night urging Mecca residents to donate blood at hospitals in the area, and queues of locals hoping to help the effort formed at hospitals and medical centres across the city. "Al Jazeera's Hasan Patel, reporting from Mecca, said witnesses told him that the crane fell on the third floor of the Grand Mosque at around 5.30pm on Friday. He said the mosque was packed even though the incident happened before the 6.30pm prayer. "Dozens of ambulances headed to the site. The authorities closed off the area shortly afterwards," he said. "This whole place is already a giant construction site. What made it worse is that around 5.30pm there was severe rain and it was just gushing down the road. "I am surrounded by people who are grieving. The mood here is of sadness." Saudi authorities go to great lengths to prepare for the millions of Muslims who converge on Mecca to perform the sacred pilgrimage. Last year, they reduced the numbers permitted to make the Hajj pilgrimage on safety grounds because of construction work to enlarge the Grand Mosque. The Hajj, one of the largest religious gatherings in the world, has been prone to disasters in the past, mainly from stampedes as pilgrims rush to complete rituals and return home. Security services often ring Islam's sacred city with checkpoints and other measures to prevent people arriving for the pilgrimage without authorisation. Those procedures, aimed at reducing crowd pressure which can lead to stampedes, fires and other hazards, have been intensified in recent years as security threats grow throughout the Middle East. Richard Angwin, Al Jazeera's senior weather presenter, said the autumn period is when half of Mecca's thunderstorms occur, so "it was no great surprise that there were thunderstorms in the area". "The area of low pressure which brought sandstorms across the Levant region moved further south, allowing hot, moist air to develop into thunderstorms along the mountains bordering the Red Sea, and some of those drifted northwards across Mecca," he said. The Malaysia-based news outlet, the Star states - "Six Malaysian pilgrims who were at the Grand Mosque in Mecca during the crane collapse have been declared missing. Minister in the Prime Ministers Department Datuk Seri Jamil Khir Baharom said the six have been identified but cannot be traced. "This morning at about 4am Saudi time (9am Malaysian time), it was said that the six made up of two men and four women have been identified but not found. "They might still be somewhere in the mosque or any of the many small clinics set up around there. So we are considering all possibilities," he said during a press conference at the TH hotel in Kelana Jaya. He asked for the families to be patient and added that the government are doing their best to trace them. "In addition to that, 10 other Malaysians have been injured in the incident. "There are seven men and three women, all of them are in a stable condition," he said adding that there were 251 medical personnel on location." At present there are a total of 22,320 Malaysian pilgrims in Mecca. The total number of pilgrims there is currently at 2 million. We join the many expressing sympathy to all those affected by this tragedy - relations of the dead, the injured as well as all those who could be suffering post traumatic stress even as you read this piece. We wish them well and prayers that Allah will have mercy on the dead as He comforts the living.